OMG!! Where do I start?? 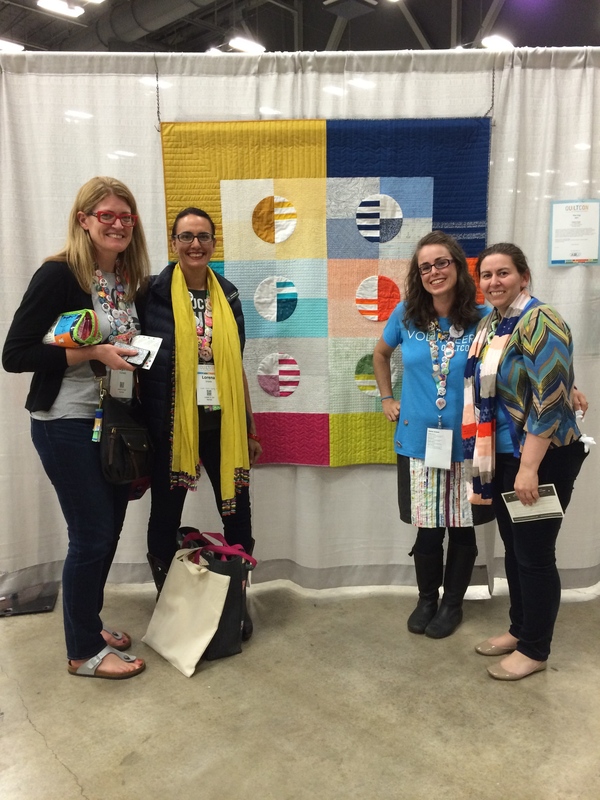 This was my first QuiltCon and I ignored all the advice from those who attended last time, and organized myself a jam-packed schedule. Oh, yes, I did. My experience was one of the best times I have ever had, however I totally now understand the advice I was given!! The best thing about trying everything….now I know what I will do and not do next time. I will definitely do more lectures next time. I liked the burst of information and the coverage of topics that were provided. 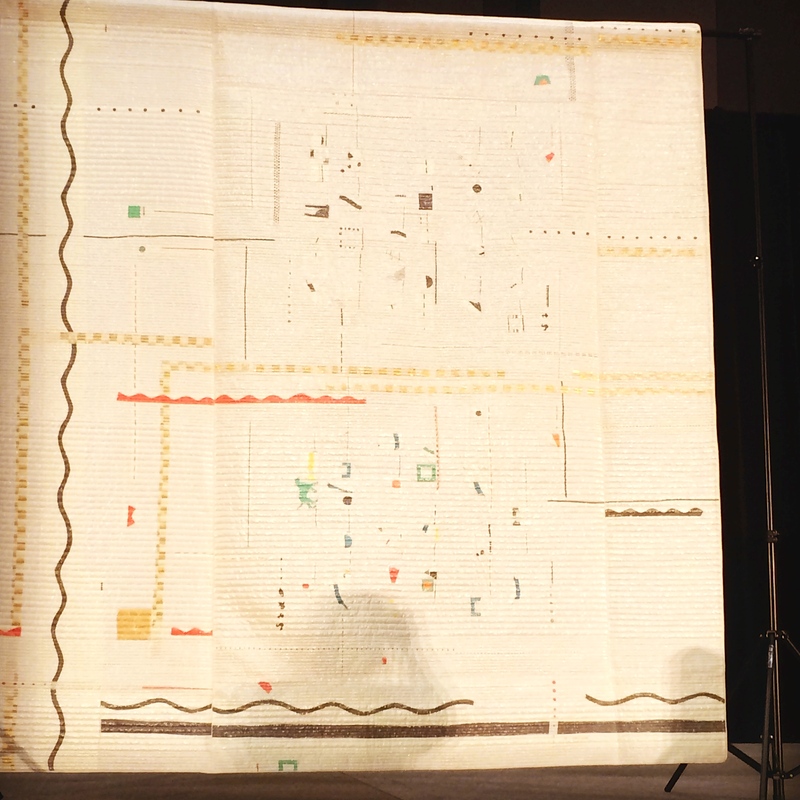 Yoshiko Jinzenji’s lecture about her process and her quilts was inspiring and one of my highlights of the conference. I loved her gold shimmering quilt that accompanied her in her lecture and shhh…one of the few fabric purchases I made, was more of her fabrics (more on that at Sunday Stash). The classes I took were great. I learned so much and the instructors I had were so amazing to meet in person. I enjoyed each class for different reasons. Triangles with Vanessa Christensen was very educational about the techniques of sewing triangles and I now know why I am supposed to use starch. It really does stabilize the fabrics. I will admit I only spent 1/2 the day in the class; as I knew the only time I would have to look at the vendors was that afternoon. Embroidery with Alison Glass was perfect for me at that time of day. I so needed something relaxing, and go with the flow at the end of that long day. It delivered completely. I now have another great hand project to do while traveling (or without my machine). 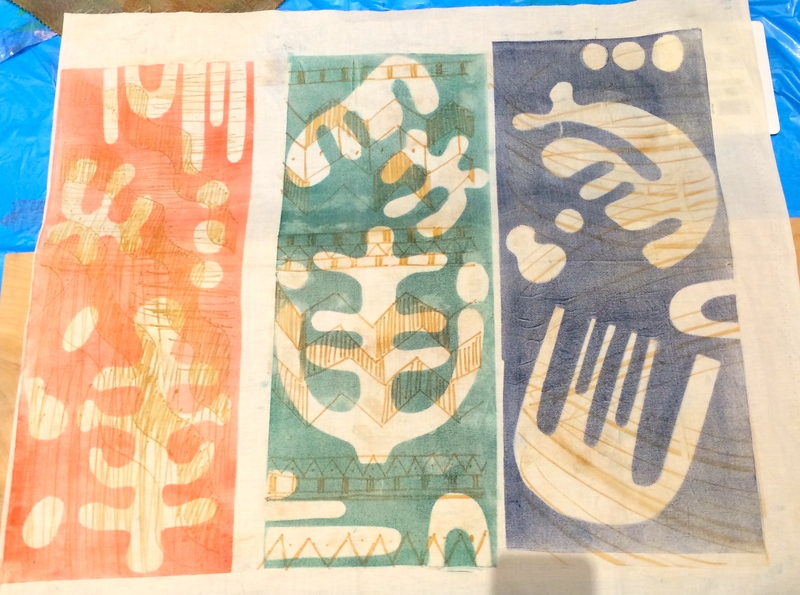 Monoprinting with Lizzie House was my favorite by a smidge. What a great technique that she offered. One that is transferable to my 7-year-old and I am hoping its something we can do together. I loved this class which is the only reason I could push through the whole day…exhaustion was kicking in. There was so much talent in the class. I loved working with the layers and the two techniques of drawing and then pressing. My final printed panel turned out better than I imagined. I highly recommend this class!! Next time I would limit myself, I think to maybe one class. I highly recommend volunteering. Everyone is fantastic. My favorite activity, hands down ;-), was white glove duty. The hours were long but my favorite thing was talking to others, who were so interested in what they were seeing. Some wanting to ask your opinion on how it was made or what technique was used etc. The added bonus of this task is you got to walk around and see all the quilts in the quilts show. The inspiration was amazing and as a white glove person you could look at the back of the quilts (of course while showing others). Volunteering is definitely something I would consider doing again but not as a whole day….spread it out a little for sure!! Meeting my peeps from the sisterhood of the traveling quilts; some of the Aussie’s, where we got our photo taken over by my quilt (below)!! ; meeting Anne, Stacey and Gillian from QDAD at the Moda Party; meeting Nicole (modern handcraft) and the NZ contingent at Moda party; meeting Denyse Schmidt and Katy Jones there too; talking with the C+S girls at their amazing booth; meeting the fabulous Nydia, Christa and many others on the quilt show room floor; BBQ with Kelsey, Amanda and Ashley; having donuts with the New Jersey MQG gals!! A shout-out needs to go out to my roomie, Ashley from @wasntquiltinaday. Best Roomie Ever!! Loved every minute including my bed every evening. So many people – missing you all already!! This entry was posted in Uncategorized and tagged 2015, QuiltCon, QuiltCon Recap on February 25, 2015 by mlwilkie. Dead envious of the whole experience, but most particularly of the opportunity to meet Yoshiko Jinzenji, who has been a particular hero of mine for years. Would also have loved to meet Ashley, whose blog I enjoy so much. It’ll never happen, but I can dream! I think that limiting to one class for me was a good idea this time, and I could definitely recommend and consider taking many more lectures next time. I love that the volunteering aspect was so wonderful, and it is definitely something I will probably consider adding into my schedule. Interacting with everyone as a white glove sounds like a fantastic experience! next time: one class, some lectures (I still haven’t done any lectures!!) and volunteering but not super volunteering. Chatting with people was the best part and I didn’t leave myself any time to do it! I do think I will volunteer next time (and add a couple of days to the trip!). I’m so glad we had dinner together, can’t wait until next time! I am glad you enjoyed your time at QuiltCon even though you over-scheduled yourself LOL I had to cancel my registration for this year due to changed financial circumstances but hopefully next year I will be able to attend-with a two month old baby probably!!!! I would love to meet you in person as I admire your designs and your talent. It’s good to hear that volunteering was fun! I’m eager to get to go to QuiltCon without a small child to nurse – I’m definitely volunteering then!!! and we loved having you there! thanks for sharing your experience!! I loved our mid-day coffee session to talk about designing and business. And that donut run was completely epic. Jersey girls are crazy. I’m so glad we had that time together, and I hope we get to spend time together again soon. Wow! I thought I had a packed schedule with 2 full day classes and 3 lectures. You have me beat! 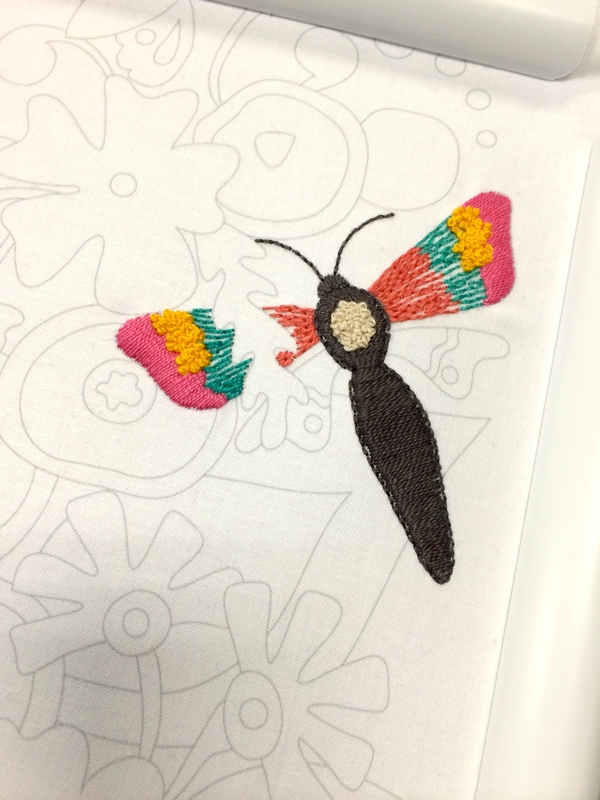 Your embroidery looks lovely–I can’t wait to learn how to do that and give some of Alison’s patterns a try! It sounds like you still got to meet SO many people despite having a jam packed schedule–awesome! 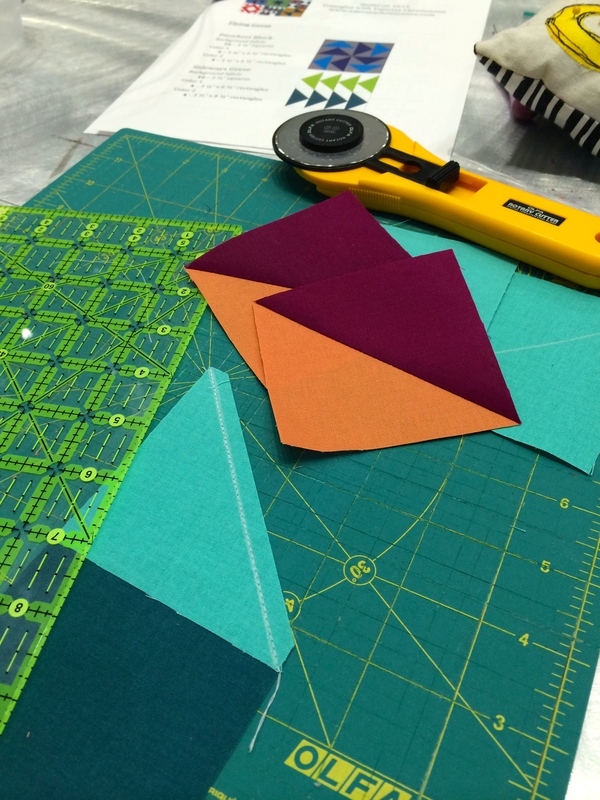 I am very much looking forward to my next QuiltCon (prob in 2 years, since I’ll have a newborn in a few months), and I probably won’t follow the advice again and will sign up for lots of classes (they were my favorite).